Following picture is taken from http://www.dheorissa.in/DHE/consolidated.aspx. This picture clearly shows the injustice of Orissa govt. and Higher Education Task Force (HETF) towards western Orissa. 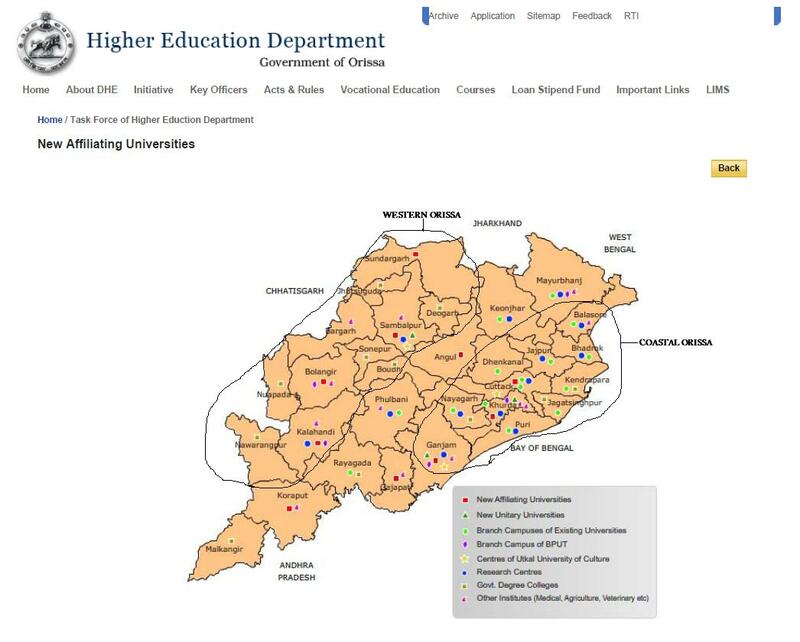 Just look at the density of the institutes in both the region, that is coastal and western Orissa. For decades people from western Orissa have been pleading to deal with inter-regional horrendous disparity. Solution offered had been to decentralize all state institutions as well as spread whatever is obtained from the central govt. but to no avail. All the centrally funded institutes are located in the coastal belt, now the new recommendation by Higher Education Task Force (HETF) adding salt to the wound of western Orissa people. The disparity is so stark that one really does not need to count. Entry filed under: Athamallik, Athmallik, Balangir, Balangir-Titilagarh-Patanagarh, Baragarh-Padmapur, Bargarh, Bhawanipatna-Dharmagarh, Boudh, Boudh, Deogarh, Deogarh, Educational Policy, Higher Education Zone, Jharsuguda, Jharsuguda, Kalahandi, Nuapada, Nuapada, Region watch, Sambalpur, Sambalpur-Rairakhol-Kuchinda, Sonepur-Birmaharajpur, Subarnapur, Sundargarh-Rourkela-Panposh-Bonai, Sundergarh, Universities, Upcoming Universities.